Trading at nearly 300 times earnings, the debt-fueled stock market has placed a considerably high valuation on Netflix. Netflix is a microcosm of the world. Just as most consumers and nations are debt ridden, overly speculative, and at the peak of irrational exuberance, so is Netflix. On Thursday, Twitter reported a third-quarter loss of $21 million, or 3 cents per share. Excluding one-time items, the company earned 10 cents per share in the latest quarter. Affordability is the worst, yet prices are near the bottom? Another day, another overreaching bill being passed in Ontario, Canada. Following up from yesterday’s blog post: if news outlets from big media are the supposed purveyors of truth, then what do they have to hide by disabling their comments section in their YouTube videos? The truth should be able to stand up on its own in an open marketplace of ideas. 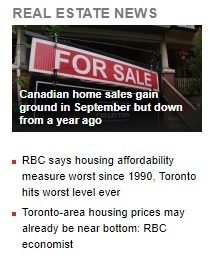 Does CP24 stand for Canadian Propaganda 24 hours a day? Posted on September 20, 2017Categories Images, News, PoliticsLeave a comment on Does CP24 stand for Canadian Propaganda 24 hours a day?